The Nats middle infield is crowded in Spring Training as there are only 3 to 4 spots that could be available on the Opening Day roster, and there are 9 players in the mix not counting Rendon who will be the Nats 3rd baseman. The favorite to win the Opening Day spot for shortstop is Danny Espinosa with Daniel Murphy already penciled in for 2nd base. The Danny & Daniel 6-4 combo could be backed up by Drew with an outside chance that Trea Turner could figure into the Opening Day roster. The others vying for a spot are Wilmer Difo, Chris Bostick, and veterans Brendan Ryan and Scott Sizemore. Jason Martinson is another non-roster invitee who is an internal candidate and a Nats player at Triple-A Syracuse. In a Simon Pond type of way, we have Scott Sizemore with the 2.125 Herculean OPS, and he is just a mere mortal with ♩ ♪ ♫ ♬ ♭ Strangers waiting, Up and down the boulevard, Their shadows searching in the night, Streetlights, people, Living just to find emotion, Hiding somewhere in the night, Don’t Stop Believin’ , Hold onto to that Feelin’! What song was Papelbon blaring on his boombox on Friday? Don’t Stop Believin’ by Journey and what a journey it has been for some of these players and we are only 3 weeks into Spring Training. Scott Sizemore is a local of sorts. He grew up in Chesapeake, Virginia near Ryan Zimmerman and attended VCU in Richmond and was drafted by the Tigers in the 5th round in a string of college signings of local players in the area with Verlander, Mark Reynolds, Ryan Zimmerman, and then Sizemore, and that doesn’t include all of the High School kids like the Upton brothers, David Wright and Cuddyer. At 29 years old, Sizemore has played in parts of 4 MLB seasons and finally eclipsed 162 career games. The Nats signed Sizemore on August 22nd last year and in a small sample size he put up some big numbers .426/.481/.574/1.056 in Triple-A Syracuse, and Sizemore’s best season in the Majors was with the A’s in 2011 where he had a .345 OBP and a .778 OPS in 93 games. In the following year, Sizemore got injured in Spring Training of 2012 as he looked like a sure bet to make the team as he tore the anterior cruciate ligament (ACL) in his left knee. Billy Beane released him after the 2013 season, and his time started there as a journeyman infielder bouncing around to the point where he is now accepting Minor League deals to stay in baseball and hoping for his chance to make this Nats team. Sizemore has put up some good splits versus left-handed pitchers in his MLB career where he has slashed .283/.362/.435/.797. Brendan Ryan has the reputation in camp as being the best defender, and Jason Martinson is the other long-shot in the mix, and Mike Rizzo has made sure that Martinson, age 27, gets some playing time. Martinson was drafted by the Washington Nationals in the 5th round of the 2010 MLB Draft from Texas State University (San Marcos) and has persevered to get to where he is at. We had a chance to talk to Jason Martinson today, and it was Doug Harris who called Martinson to invite him to Spring Training which has been a great experience for Jason. 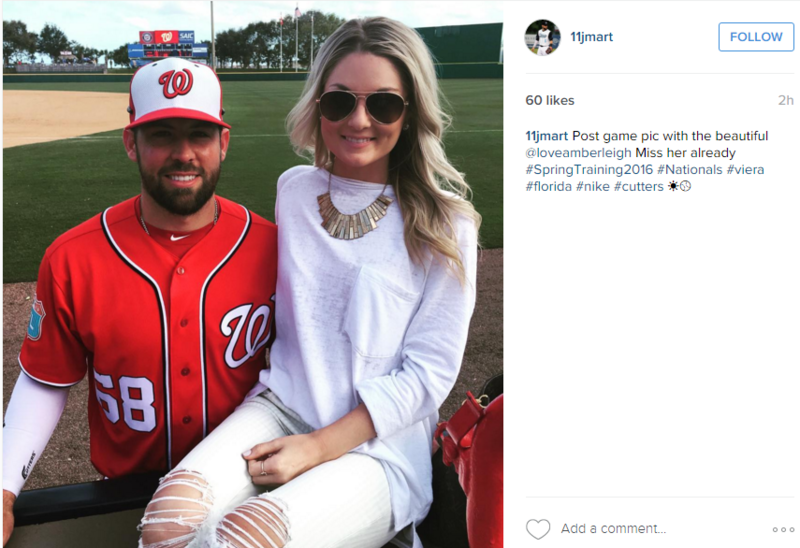 Martinson like other Nats who are home-grown are part of Rizzo’s philosophy where you prove yourself at every level. Martinson was part of the Arizona Fall League class with Skole, Rendon and Goodwin and has moved up every level and is now in Triple-A Syracuse. Martinson’s favorite part of Big League camp is “being around the ‘main guys’ and trying to pick their brains, and if not verbally, seeing how they go about their business.” Jason remains good friends with Rendon as they played against each other in College when Rendon was at Rice and Martinson was at Texas State, and as mentioned they were in the AFL together. A great piece of trivia is that Paul Goldschmidt was Martinson’s teammate at Texas State University, and Goldy was actually drafted in the 8th round out of Texas State while Martinson was a 5th round pick. They were actually workout partners after college back in the Dallas area before Goldy moved full-time to Arizona. Martinson said, “I try to stay as humble as I possibly can and be level headed and know where I came from. I try to be as good as a teammate as I can and help the organization.” You can definitely tell what a good person that Jason Martinson is and expect one day that he gets his chance in Nats Park. Dan Uggla was a long-shot last year and made it to the Opening Day roster based on an injury to Rendon in Spring Training and that just shows that there are some things you never see coming when training camp starts, and this is why you don’t want to count any of the players out at this point.